Do you feel like you missed the boat? Are you burnt out? Have your feet been dragging the sidewalk? Do you catch yourself dreaming of what could have been? Of if-only-I-had, or if-only-I-hadn’t? This book is for anyone sitting in the audience who should be on stage, anyone reading blogs who should also be writing them, anyone supporting ministries who should be leading them. It’s for the Christians who know there is a better life, but who are just stuck in the one they’re living. Saved in the Jesus Movement of the seventies, Chris DuPré connected with countless Christians across the world. Yet too many of those Christians, Chris discovered, have years later lost the fire and stepped back from living out their faith. Why? Because they got stuck—stuck in rejection by others, stuck in fear of the unknown, stuck in loving a comfortable life, stuck in scores of similar ruts. What can set them free from their internal prisons? And what could Christians accomplish if we all just got unstuck? My Thoughts So many of these "self-help" books are hard to read and feel like you are being talked down to, but I found this book to be really easy to read and very relatable. As I read, I found myself finding things in my life that I could apply the ideas in this book. 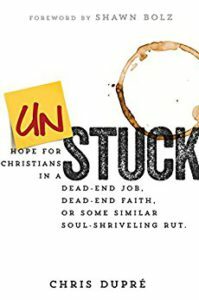 I think this book is very encouraging to Christians who want to move past difficulties in their life, and will help people who don't even realize that they are "stuck". Originally from Upstate New York, Chris moved to Kansas City to work alongside Mike Bickle in establishing the International House of Prayer. Chris recently served as Associate Pastor at Grace Center Church in Franklin TN, and is now an associate pastor of Life Center in Harrisburg, PA. A pastor, teacher, worship leader, traveling speaker, and spiritual father to many, Chris may be best known for his song “Dance With Me.” He has produced eight albums and published three books, including The Wild Heart of God (Whitaker House, 2016) and The Lost Art of Pure Worship with James Goll. Parents of three daughters and grandparents of four grandchildren, Chris and his wife, Laura, reside in Harrisburg, PA. I grew up in a small town about 30 miles east of Rochester, NY. Winters there could be brutal. One year, I received beautiful new pair of boots which I loved, particularly for the joy with which they enabled me to engage in the marvelous sport of puddle jumping. One day when the ice and snow had begun to melt, I eyed a nice puddle and jumped in the middle sending a freezing splash in all directions. But wait, something was wrong — this was no ordinary puddle! This one was made to capture people, and I was captured! Frantic, I pulled one foot out, but no matter how much I tried, the other foot would not budge. My boot was stuck. I was stuck! I pulled and pulled until finally my foot came free in a soggy sock. My beautiful boot had been left behind, buried beneath the slush. My little mind was faced with a choice. Did I care enough about to do something? It only took a second to act. I loved those boots. I found a stick and began to fish. After what seemed like an eternity, I finally pulled out my boot. That’s the first time I ever went fishing and was glad to catch a boot instead of a fish. My desire with this book is to address some of those “stuck” moments we all face. I want to provide keys that will hopefully open a door or two that have held you back on the incredible journey of life. I say a door or two, or even three, because it’s almost always more than one thing that gets us stuck. Ah, but God—He is the change factor in all of this and in Him we can break free. 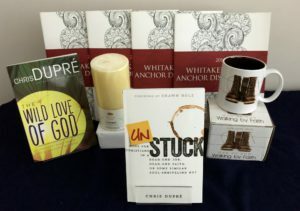 Second Place Prize: Unstuck: Hope for Christians in a Dead-End Job, Dead-End Faith, or Some Similar Soul-Shriveling Rut by Chris DuPré; and The Wild Love of God: A Journey That Heals Life’s Deepest Wounds by Chris DuPré”.